Women’s track and field senior distance runner Janelle Noe finished heat two of the 1,500-meters in 10th place and came in 30th overall at the USA Track and Field Championships June 21 in Des Moines, Iowa. Noe crossed the line in 4:25.38 and becomes the first Rocket under Head Coach Linh Nguyen to compete at the championships. “This is the biggest stage for track and field in the country,” Nguyen said. 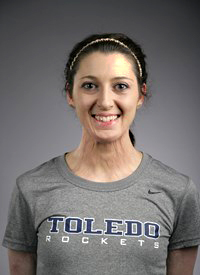 “To have her out here as a collegian and representing The University of Toledo is just amazing. She earned this race, and I’m glad she got a chance to run. In addition to her success on the track, Noe’s continued recovery from an off-campus incident that occurred in 2016 that left her severely burned has gained the attention of national publications, and news outlets and fans are eager to follow the Sylvania, Ohio, native. Noe turned in a strong performance at the NCAA Outdoor Championships, where she beat her personal record by six seconds in the 1,500-meter prelims (4:10.83) and finished 11th in the finals after crossing the line in 4:20.37. She claimed the best finish by a Rocket in the NCAA Championships since April Williams took eighth in the triple jump in 2007. She had a breakout season that saw here lower her 1,500-meters time by almost 20 seconds and break the Mid-American Conference record at the MAC Championship Meet with a time of 4:17.01. This entry was posted on Thursday, June 21st, 2018 at 8:43 pm and is filed under Athletics, Events, News .